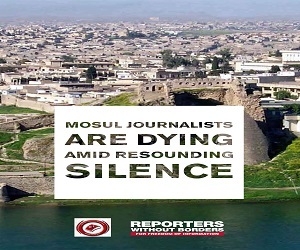 The Journalistic Freedoms Observatory (JFO) expresses its concern over recent attacks against journalists in all governorates of Iraq, including the Kurdistan region, and considers these attacks as a genuine threat to freedom of expression and press freedom in Iraq. 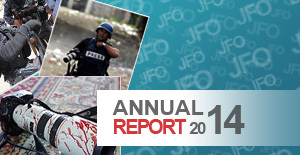 The JFO recorded numerous cases of violations against journalists, media institutions and journalists, which demonstrate the security leadership’s disregard for the Iraqi constitution and international conventions, including the Universal Declaration of Human Rights. Security forces have launched a major campaign of raids on media institutions, both in Baghdad and throughout Iraq. They have stopped Al-Diyar satellite channel from broadcasting, smashed its equipment and detained its journalists, as well as breaking into the Journalistic Freedoms Observatory and confiscating equipment on February 23rd. Security forces in the province of Salah al-Din shut down four local radio stations “Salah al-Din FM, Diertna Radio, Baiji Radio and Balad Radio” for a period of three days. Security forces have attacked journalists, destroyed and seized photographers’ equipment, while others faced abuse in detention centers after being arrested. 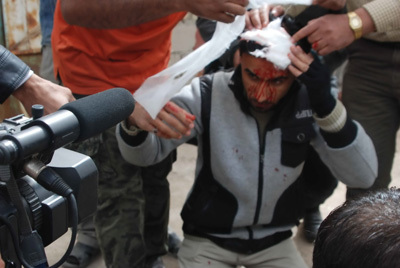 Some journalists in the KRG have been attacked by suspicious armed gangs and government forces. The television and radio stations of "Nalia" were destroyed after being set on fire by gunmen. Radio “Dang” was attacked by another armed gang. 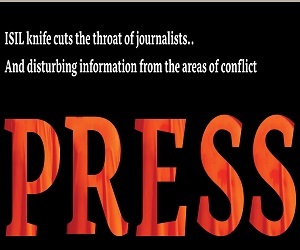 The JFO registered, through its representative in the KRG (The Metro Center to Defend Journalists) approximately sixty cases of assault on journalists and media institutions. The JFO also documented, in images and video clips, assaults against several journalists to by security forces in the region. According to statistics of the Journalistic Freedoms Observatory & the Metro Center, the number of attacks on journalists all over Iraq amount to more than 160 cases, including about 60 violations In the Kurdistan region alone. The current tally shows that 33 reporters have been subjected to arrest and detention. There have been 40 instances of obstructing the constitutionally protected work of journalists and confiscation or damaging of equipment. Another 12 journalists have been injured by being beaten by riot police or other security forces or by sound bombs shot into crowds as a way of dispersing them. 9 media organizations have been raided, searched and closed by security forces, only 5 of which were later permitted to start operations back up. The JFO partner in KRG, Metro Center classified the attacks on journalists as 50 cases of attacking and smashing equipment, while 7 of other reporters arrested and injured. Also 3 other different media institutions were attacked and breaking into them. The Journalistic Freedoms Observatory expresses its concern of recent attacks against the press, strongly condemns them and calls on the Iraqi government to take action to reduce these attacks and violations. While the JFO recognizes apologies made by some Iraqi officials for attacks on and harassment of journalists and media organizations, it stresses that authorities make every possible effort to ensure the safety of journalists covering the events and demonstrations without harassment. It also calls on authorities to investigate all attacks against journalists and media institutions and bring those responsible to justice.